It is just a few days until the United States celebrate their Thanksgiving on Thursday, November 27th. Thanksgiving Day is a holiday celebrated in the United States on the fourth Thursday in November. This is one of the more important holidays where friends and families spend time together. Family time would not be complete with the all-important family dinner. Of course roast turkey is a tradition in many homes. Even though we have celebrated our Canadian Thanksgiving in October, I am reminded of a special USA turkey dinner in a special place not too long ago. My Man and I travelled to a small island in the Cook Islands. This island was Rarotonga and it’s a beautiful vacation place and not what one would think of as being linked to Thanksgiving…or is it ? Here is what transpired one Thanksgiving Day 1989. We were relaxing by the pool at our hotel when we noticed some of the local villagers come in and start digging a huge pit in the sand on the beach. This peeked our curiosity so we went over to get a closer look. Before we knew it, there was a large gathering of people crowding around and watching as well. Everyone was happy, friendly and in a party mood. Who were these people? Turned out they were our fellow travellers; many of them our USA neighbours to the South. We found out that they didn’t come empty-handed to this beach party either. These vacationers had planned ahead for their Thanksgiving. They had packed four large turkeys in their suitcases and had brought them from the USA. They had planned for an American Thanksgiving Day feast “Maori style”! After the pit was dug, and the fire was blazing and the embers glowing red-hot, the prepared turkeys were put in and immediately covered with banana, papaya, mango and other leaves that we did not recognize. The turkeys were then left to bake for the next 3 hours. Everyone was in a festive mood and soon we were celebrating along with our new friends. When their turkeys were cooked and all the trimmings served up, we too were invited to share in their memorable Thanksgiving Day dinner. It was pretty memorable for us ! They may not be Maori-style but my Ukrainian-style recipes are sure to please. Be sure to check out the recently added Turducken Roll. Please try it and let me know how it all goes for you. Yes, I grew up in Manitoba, now live in BC. Sorry if I’m confusing you. Yes, I am reflecting on the US thanksgiving that’s coming up this Thursday. Makes me think of turkey. Guess it just brings back some memories of eating turkey that was cooked in a fire pit. 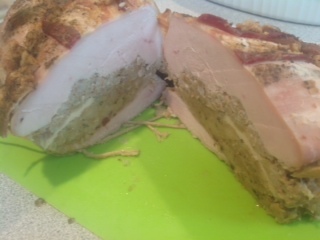 I just finished experimenting with making a turducken roll.